Say goodbye to that stinky litter box and hello to incredible odor control and long-lasting absorbency with Naturally Fresh Multi-Cat Quick-Clumping Cat Litter. Made from a proprietary blend of the fibrous materials found in the walnut shell, this litter neutralizes litter box odors better than clay, pine and wheat. It produces harder clumps for easier scooping and is so absorbent, one bag is equal to three bags of the leading clay litter. Unlike clay litters which throw off silica dust, Naturally Fresh is virtually dust-free so you and your cat can breathe easy. And because it doesn’t stick to your cat’s paws, it won’t be tracked throughout your house. This quick-clumping litter is formulated for households with multiple cats. Formulated with annually renewable sources and no chemicals, toxins, clay, corn, or grains, so it's safe for you and your kitten. It's low tracking so you won't have litter throughout your home carried by your furry friend's paws and helps you maintain a clean environment for you cat by hard clumping so clean up is breeze. Made from a blend of walnut shells, this eco-friendly litter may help neutralize odor better than clay, pine and wheat litters. Fill clean litter box to the recommended level of 3 inches of BLUE Naturally Fresh Multi-Cat Quick-Clumping Litter. BLUE Naturally Fresh Multi-Cat Quick-Clumping Litter forms an easily removable clump of waste when wet. Remove with a scoop and discard according to your local regulations. Maintain by removing clumps and solid waste daily. Add more litter, as needed, to maintain 3 inches depth. Start by placing one to two inches of Naturally Fresh Litter in a clean cat litter box. Top dress with enough of your current cat litter to cover Naturally Fresh Multi-Cat Quick-Clumping Litter. Each time you change the litter, reduce the amount of your current litter. I am on the search for an eco-friendly cat litter, this brand was my first attempt. My concerns and rankings in order of importance are: 1. Odor control (my cat has the smelliest poops I've ever encountered): Average. 2. Low tracking - I have a traditional covered litter box with a small rubber mat in front. : Poor. 3. Price. : Average. 4. Absorbency. : High. Overall, I was impressed by this cat litter for a natural alternative. Personally, I cannot live with how much this litter tracks, so I will not reorder and I would not recommend unless you are already used to very lightweight litter. This litter has very good odor control. It's clumping is different, but still effective. It is rather messy though. Due to the dark colour, one can easily imagine the dust hue it leaves. While already, a vigilant pet area cleaner, I have ramped that up. The tracking isnt any better or any worse than other litters; it is just very visible. My cat easily transitioned to it from the familiar sealing litter. My foster kitty easily transitioned as well. We tried this cat litter out in one box for a month against Nature’s Miracle Clumping Corn litter, which we have been using for almost 3 years. We have 2 cats and 3 litter bins. One with a hood, and 2 top entry. Hands down the Naturally Fresh Walnut litter was better at clumping, smell, and longer lasting. We would have to replace the corn cob litter each week as it would break down and not work as well. 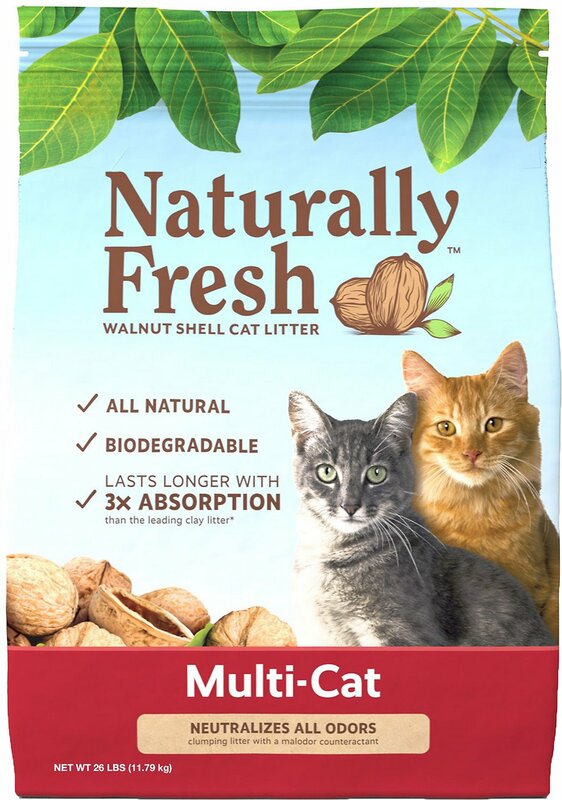 The walnut cat litter has that walnut fresh smell for a month. We were so surprised. It is a bit dusty inside the cat litter bin, you can see the dust in the sides. But less tracking on the carpet pad by the litter. So happy we found this litter! Highly recommend. I’ve been using this litter for a couple months now and I love it! I like using the all natural litters because I hate the smell of clay litter. This litter does not smell bad and it clumps really well. I have 2 cats so making sure it won’t smell bad is important to me. My cats also transitioned to this litter well and they seem to like it! I definitely recommend trying this litter if you’re looking for an all natural clumping litter! This litter is lightweight and clumps well, and it covers odors. But it is definitely not dust free, my cat comes out of the litter box with walnut colored paws from the dust. I was hoping the no tracking claims would be true as well, but it still tracks quite a bit. Although it is still dusty and tracks, it is less dusty than the clay litters I have tried, and tracks a little bit less than them as well. My cat is a digger though, so if your cat isn't trying to dig to China every time she poops like mine, this litter will probably work pretty well for you. This litter has great odor control, but it is dusty for sure and my cats track it all the time. I’m constantly sweeping and vacuuming because the little particles on the kitchen floor and carpet drive me crazy. Plus with it being brown, it stands out even more when my cats’ dusty paws step onto a light colored blanket. I don’t hate this litter but I’m looking to try something else. I love this litter- it has no chemicals, doesn't smell, isn't dusty... One of our 5 cats has bad asthma, and our previous clay-based litter was terrible- super dusty. This stuff (Naturally Fresh) smells good, and is very lightweight. It clumps very well, and actually dried out urine so it is quite lightweight when I scoop it out- much more so than with clay-based litter. I wish I had found this years ago. There are no negatives to this litter. I have three cats. I have tried so many different litters! I'm trying very hard to find one that is ecologically friendly, but does the job. Tracking of litter is such a huge problem, I'd just about given up finding a clumping litter that doesn't end up all over the room. This one clumps well, contains odor, and is heavy enough not to track. AND, it is made from walnut shells that would otherwise go discarded! I have one fussy kitty that won't go in the box with this, but she is now OK with 50/50 blend and I'm gradually adding more of this one to get her off the clay litter. I'm loving it and it has a nice, natural nutty smell, too! Ok. Well I have allergies but the clay litters really make me ill. Sooooo. I like armnhammer light weight and their slide but there is some dust that makes my cats eyes water and she sneezes.....so I got naturally fresh walnut unscented. She went right to it and yes, it has a form of walnut dust from tiny particles, but kitty no longer sneezes or has dripping eyes.....so this is good. The walnut litter smells better to me than the corns or grass ones...and I keep a small ionizer by the box to help settle any walnut dust down. This is great for us. Thank you.